The P3RA is a wireless stereo body pack receiver for use with the PSM300 Personal Monitor System. 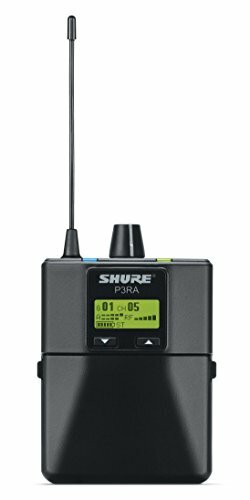 With detailed 24-bit digital audio and reliable wireless performance, the P3RA body pack delivers professional personal monitoring to any corner of the stage. Patented Audio Reference Commanding ensures the clearest sound, with ultra-low noise and no artifacts. Find a wireless channel easily, using the scan function to automatically select the cleanest frequency available from a wide tuning bandwidth. Adjust the volume and use Mix Mode technology or stereo mode to create a personal mix from two channels of audio. EQ and volume limiting further individualize the sound via the high contrast LCD menu. With a compact and rugged aluminum body, the P3RA ensures a long lifetime of use and easily clips onto a belt or guitar strap. Two standard AA batteries provide up to 6 hours of continuous use. The optional SB900 rechargeable battery (sold separately) extends runtime and allows easy in-unit charging.